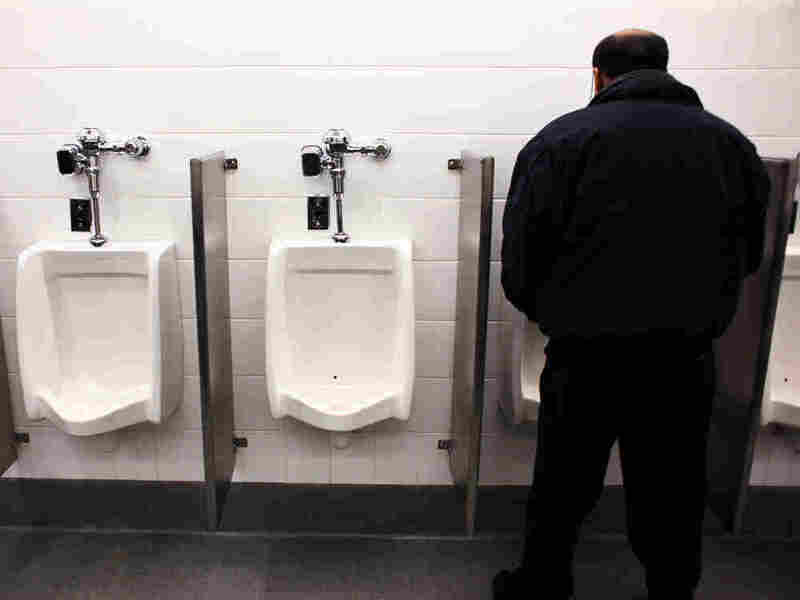 There's A Fly In My Urinal : Krulwich Wonders... As men may have noticed, flies are turning up in urinals with increased frequency. Not real ones, but lifelike images carefully positioned in the porcelain bowl. It seems the very presence of the fly drastically reduces "spillage." But why flies? This will have to be a guys-only experience, but should an urgent need send you to the men's room at Terminal Four at JFK Airport in New York, or to the men's rooms at Schiphol Airport in Amsterdam, or to any number of stadiums, or -- for any 10-year-old boys reading -- to more and more elementary school bathrooms all over America, you may see, right above the drain, a perfect facsimile of a house fly. No, it's not a real fly. It's a drawing, baked into the porcelain bowl. Or it may be a peel-and-paste decal attached to the bowl. "They've been spotted in Moscow, Singapore," Thaler says. He thinks he knows why. 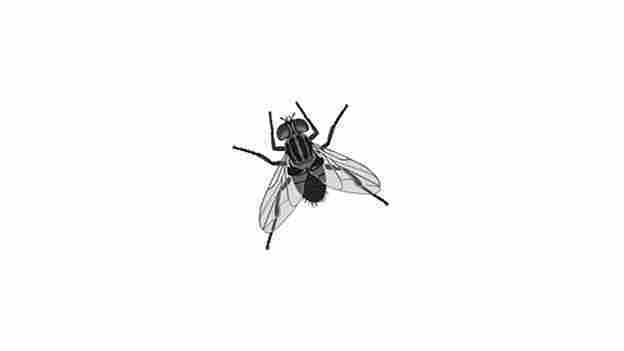 The presence of a fly in a urinal literally changes human behavior, he thinks -- or at least the behavior of human males. "Apparently," Berenbaum says, in males, "there is a deep-seated instinct to aim at targets," and having a fly to aim at reduces what she politely calls "human spillage." When flies were introduced at Schiphol Airport, spillage rates dropped 80 percent, says manager Aad Keiboom. A change like that, of course, translates into major savings in maintenance costs. Thaler has tried to imagine how the airport made its calculations. "I'm guessing somebody went to the urinals without flies and repeatedly soaked up the ordinary spillage with a paper towel," which he then figures was carefully weighed on a scale. Then the same experiment was done at fly-emblazoned urinals, and presumably the scales reported a dramatically measurable difference in soakage. However it was done, it's not exactly news that urinal targets reduce spillage. Julie Power, co-founder of a blog called Moms To Work, says she recently took a red Sharpie pen and wrote "AIM" in big letters on her home toilet bowl, and her twin boys immediately focused on the target. This feature requires version 10 or higher of the Adobe Flash Player. Get the latest Flash Player. NPR science correspondent Robert Krulwich explores adventures in science with help from designers, performers, cartoonists, animators and filmmakers. Among them, Web favorites OddTodd and Lev Yilmaz. Another mother reported on Thaler's blog Nudge that she tears off individual patches of toilet paper and tells her boys to "cut this in half." It apparently works. Thaler recommends Cheerios. Even though they move, or maybe because they move, Cheerios tend to focus young male minds. Of course, the real mystery of the public urinals is: Why flies? Why not ducks or snakes or any mammals? "Well, what do you want to pee on?" answers Doug Kempel, whose company Urinalfly sells peel-off flies for school and home bowls. Kempel is about to launch glow-in-the-dark fly decals for the adult male market because, he says, "men, evidently, hate to turn on the light at night because it blinds them," and they'd rather navigate to a soft glow in the bowl. Kempel says while he has dabbled with a bull's-eye design, flies seem to have a special appeal. Keiboom in Amsterdam says the original fly idea was proposed almost 20 years ago by Dutch maintenance man Jos Van Bedoff, who had served in the Dutch army in the 1960s. As a soldier he noticed that someone had put small, discrete red dots in the barracks urinals, which dramatically cut back on "misdirected flow." Two decades later, he proposed to the airport board of directors that the dots be turned into etched flies. According to Keiboom, Van Bedoff decided that guys want to directly aim at an animal they can immobilize. The ability to use one's natural gifts and achieve victory over the foe while standing is the key, he explained. Guys, he felt, can always beat flies. That's why flies are so satisfying. Berenbaum, the entomologist, says she's not convinced. More than a hundred years ago in Britain, bathroom bowls also sported insect images, she says. 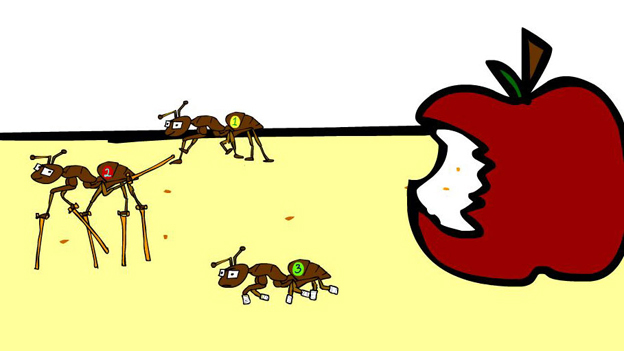 Back then, however, the favored target was not a fly, but a bee. And bees have stingers. It seems that men in the 1890s were willing to take more imaginative risks when peeing.